All the MVC controllers are derived from Controller class under the name space System.Web.Mvc. In ASP.NET 5, Controller is part of namespace Microsoft.AspNet.Mvc and all the controller derives from this. These can be used either MVC controller or Web API controller or a combination of both as shown in above picture. Note – With ASP.NET 5, Microsoft releases another version of MVC as ASP.NET MVC 6. In this post, I have referred MVC 6 many times based on the context. Let’s explore it via example. We will create a simple asp.net mvc 6 application. We’ll start from asp.net 5 empty application. File -> New Project -> ASP.NET Web Application -> Type <Project name>. Now open startup.cs and add MVC in ConfigureServices method and use that in Configure method there and provide the default route. It is working as expected. We have just a created a normal ASP.NET MVC 6 application from an ASP.NET 5 empty solution. Here we got the same MVC View and when we click on Call API button which call web api method via jQuery ajax. The response is encircled on the screenshot. So we can see here that the same controller is used as MVC and Web API controller both. It is true one ASP.NET. Here we can see that I have just put the route as /[controller] at class level, this is a generic route which take the name of the controller (Here Home),so even if the name of the controller changes we don’t need to change the route. Similarly, we provided the route definition on the action. Here we have given two routes to the controller one is already discussed above and other is a default route. So if user doesn’t give the controller name, it will take as Home. Similar we did for action as well. So now we can access this url as http://localhost:20199/home/index and http://localhost:20199/ both. In above screenshot, we can see that we gave two different routes on two action method of the same controller. 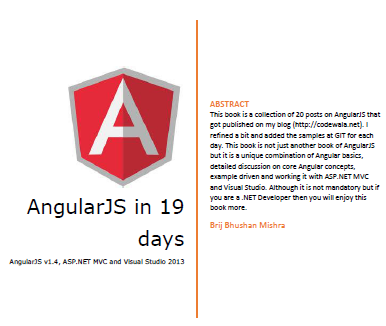 This entry was posted in ASP.NET 5 and tagged aspnet5, ASPNETMVC, aspnetwebapi, controller. Bookmark the permalink.